Libya and Nigeria are heading into high-stakes elections that could usher in a period of instability and disrupt oil supplies. Outages in the two OPEC nations would make it harder for the cartel to compensate for the loss of supply from Iran and Venezuela. Two OPEC members could soon determine whether oil prices spike back towards $100 a barrel — and those countries are not Saudi Arabia and Iran. With U.S. sanctions choking off Iran's exports and Saudi Arabia hiking output to fill the gap, it's crucial for other major producers to keep crude flowing in the coming months. That's why many analysts are paying close attention to Nigeria and Libya, two nations heading into high stakes elections and where output has swung wildly in recent years. In Nigeria, Africa's largest oil producer, a change of leadership threatens to unsettle the current government's arrangement with militants who wreaked havoc on the country's oil output two years ago. In Libya, it's uncertain whether elections meant to resolve a long-running dispute between rival governments will bring an end to more than four years of civil conflict that has frequently disrupted the nation's crude exports. The situation in the two countries could play a "big role" in determining the price of oil — which is trading near four-year highs — according to Helima Croft, global head of commodity strategy at RBC Capital Markets. "What I always worry about is the stories we should be watching, the unstable suppliers," Croft recently told CNBC's "Worldwide Exchange." RBC has warned clients that 500,000 barrels per day could be periodically lost from the two nations, and elections may bring additional unrest. Half a million bpd represents just half a percent of daily global demand, but a disruption of that scale would have an outsize impact given the anticipated loss of roughly 1 million barrels a day of Iranian crude in the coming months. Iran's exports are shrinking as oil buyers cut off purchases under threat of sanctions from the Trump administration. "If you're going to have Venezuela continuing to decline, a million barrels of Iran off the market, you can't afford to lose another big, major producer," Croft said. Washington is largely depending on Saudi Arabia, Russia and a handful of other producers to keep the market supplied and prevent an oil price spike as Iran's shipments dwindle. Traders recently sent Brent crude to nearly four-year highs above $86 a barrel, as fears that the Saudi alliance will fall short stoked concern about $100 oil. Investment bank Barclays does not think oil prices will hit triple digits, but the outcome of Nigeria's elections in February presents the biggest risk to that outlook, Michael Cohen, the bank's head of energy markets research, said in a recent note to clients. If Nigeria's political opposition unseats President Muhammadu Buhari, Barclays analysts believe the new leadership will probably have to renegotiate a deal with militants brokered by Buhari's government. During a political transition, militants might resume attacks on oil infrastructure, which caused Nigeria's output to plunge by about 400,000 bpd in early 2016. Analysts at Barclays say there's a growing chance that the opposition can present a credible alternative to Buhari, whose popularity is waning and who spent much of his presidency seeking medical treatment overseas. "Oil market participants ought to be more concerned about the possibility of disruptions in the Niger delta," Cohen wrote, referring to Nigeria's southern oil-producing region, a maze of waterways where militants staged daring attacks between 2006 and 2009 and again in recent years. Oil theft also remains endemic in the Niger Delta. This month, a pipeline blast believed to be caused by petroleum thieves killed dozens, sparking protests among locals who blamed the Nigerian National Petroleum Corporation for the explosion. Meanwhile, Libya-watchers are concerned that presidential and parliamentary elections meant to unify the divided country could in fact spark a fresh round of infighting. Rival governments in the country's east and west have yet to agree to a new constitution, and elections slated for Dec. 10 now may not happen until next year. Libya's output has been a bright spot lately. In September alone, it jumped more than 100,000 bpd, helping to offset a 150,000 bpd drop in Iranian production. But while recent clashes have not impacted Libya's oil supplies much, "rampant insecurity" creates a high risk of serious disruptions over the next six months, said Hamish Kinnear, a Middle East and North Africa analyst at global risk consultancy Verisk Maplecroft. Kinnear notes that the most recent supply outages have been caused not only by a high-level political standoff in June, but also kidnappings by armed groups in July. "Increased Libyan supply has been essential in replacing declining Iranian output over the last two months," Hamish told CNBC in an email. "Any disruption akin to the June and July outages over the next two months would leave a significant gap in supply and likely cause a spike in prices." There are signs that that oil prices won't run up as much as feared just a few weeks go. Forecasters like OPEC and the International Energy Agency have recently lowered their outlook for growth in oil consumption, citing trade tensions and troubled finances in some emerging markets. 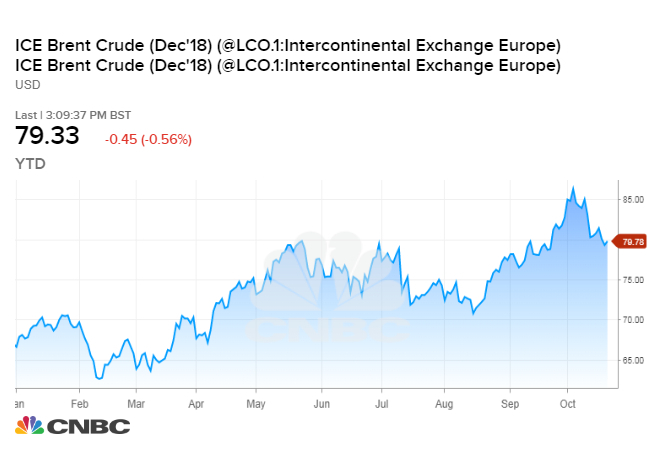 The recent stock market pullback also took the momentum out of the oil market, with crude futures tumbling about $8 a barrel from four-year highs last week. However, the slaying of journalist and U.S. resident Jamal Khashoggi by Saudi agents has injected fresh uncertainty into the oil market and raised questions about the U.S.-Saudi alliance. Saudi Arabia's energy minister says the kingdom has no intention of using its dominant role in the oil market as a weapon and still intends to hike output to offset the drop in Iranian exports.